CiclaValley would like to think that I connect with the people with my hard hitting commentary and award winning journalism. But it seems when I post videos of crap happening, that’s when I get the most attention. 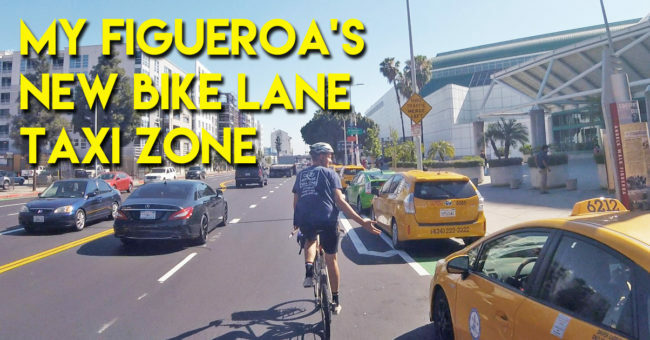 Wednesday afternoon, I was riding with my work cohort Kevin down the newly configured My Figueroa corridor. I had already seen a bunch of shots with parked cars on top of the lanes, but hoped that came from some initial confusion. Heading southbound, it was easy to spot a cavalcade of vehicles all lined up where they ain’t supposed to be. I threw the video up on Twitter and thought that was that, but when I checked in later, things seemed to blow up. As you can tell through the video, there was a big lack of concern ignoring the signage that this was a no stopping zone. One person who responded on the thread seems to be with the taxi authority and said fines and suspensions would be handed out to those that disobeyed. There also appears to be ride share drivers and chartered buses as miscreants, so I wonder who will take care of those? + @seanmeredith We are working with enforcement, council districts, businesses, and our sister agencies to make sure we use the roads safely and legally. I’m happy to report that the lane was clear after we passed Venice and getting accustomed to the bike signals is going to take some getting used to. Enforcement will help, but I’m going to need some bollards in place if something significant is going to be done about it because drivers will take what you give them.